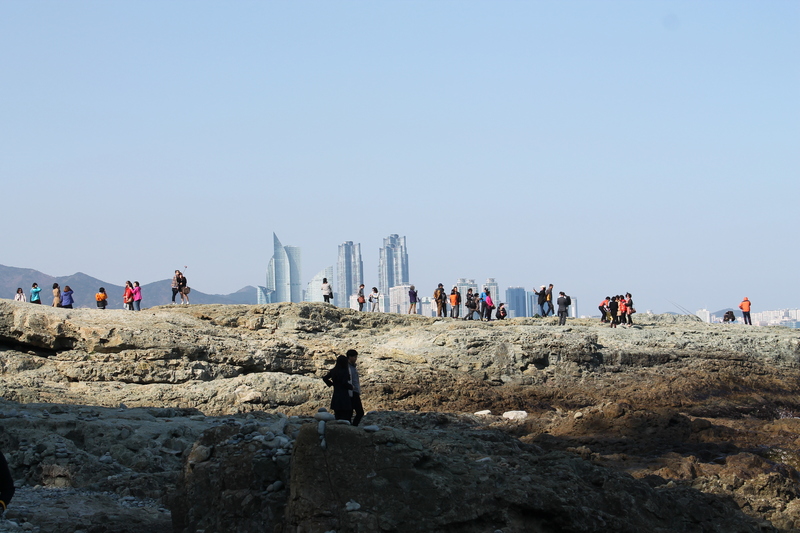 Last week I mentioned that we’d intended to take a day trip to Busan and had to postpone because of the rain. This past Saturday we cashed in our rain check and headed down to the coast for the day. 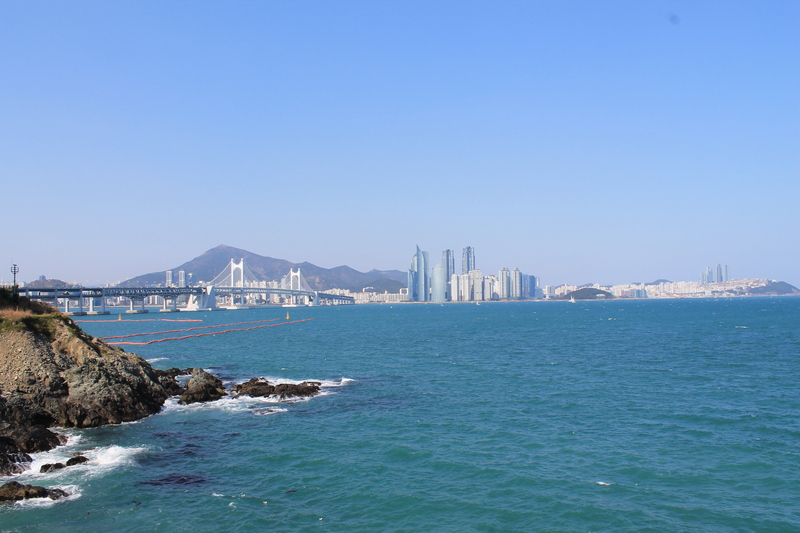 Busan is the second largest city in Korea (after Seoul) and is situated on the southern coast. It is also our favorite city in Korea. 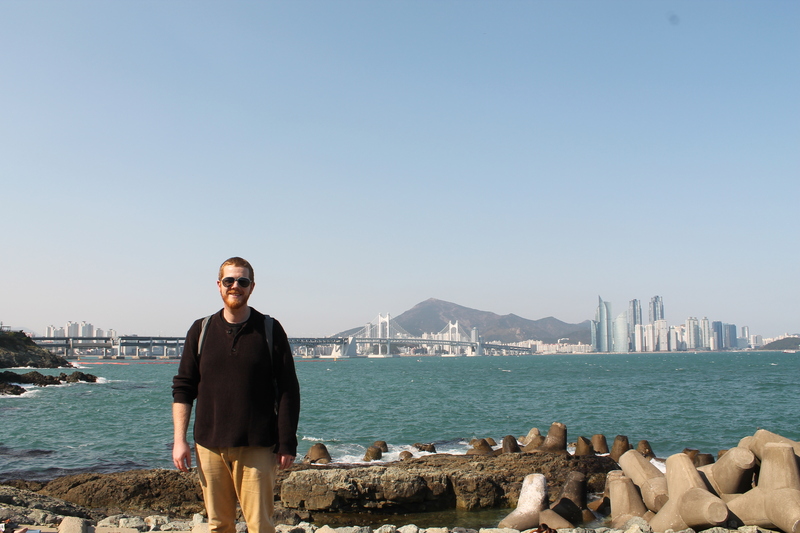 We like it because, with the water, the beaches, and an actual skyline, it has a more unique look and feel than any other city we’ve been to in Korea. We also love breathing in some of that fresh sea air. We can reach Busan in 45 minutes on the KTX (high-speed train) or 1 1/2 hours on the slow train. We weren’t in a hurry so we took the slower train in the early afternoon and made our way straight out to the coast. 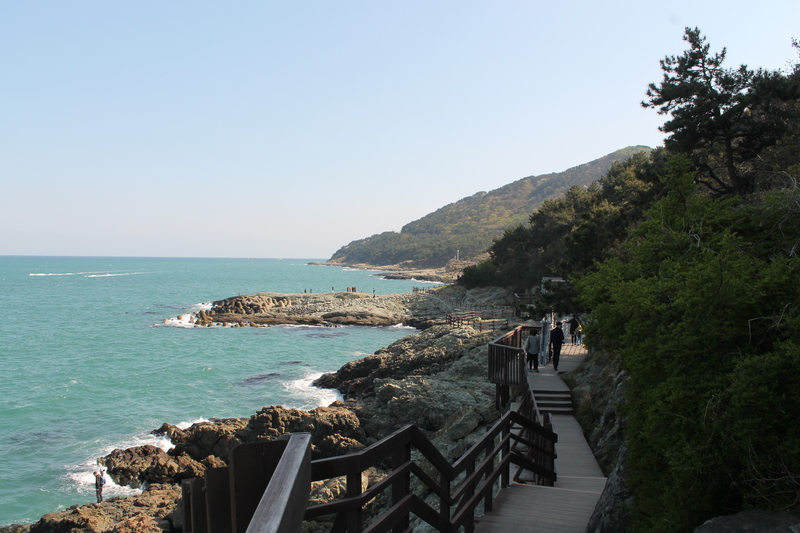 We decided to check out a large park called Igidae which is located on a small peninsula with a seaside path along the rocky cliff edges. 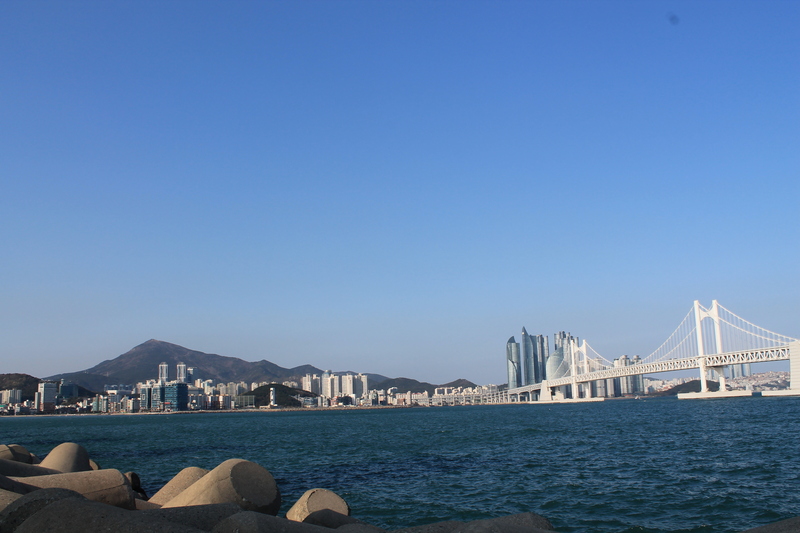 From the path we were able to look back and get a great view of Gwangan Bridge and Gwangali beach, one of my favorite bits of the city. While we didn’t do extensive research we did learn a little bit about the name Igidae and its historical significance. Like nearly every historical monument or emblem in Korea, the story behind this park has to do with a Japanese invasion. as a reprisal against the Japanese invasion of their homeland. The path itself was very gentle and easy to walk with the exception of the suspension bridges which naturally terrify me. It just occurred to me that maybe my real fear is cables since both cable cars and suspension bridges produce this reaction in me. It’s actually more of the dangling that I hate so much. 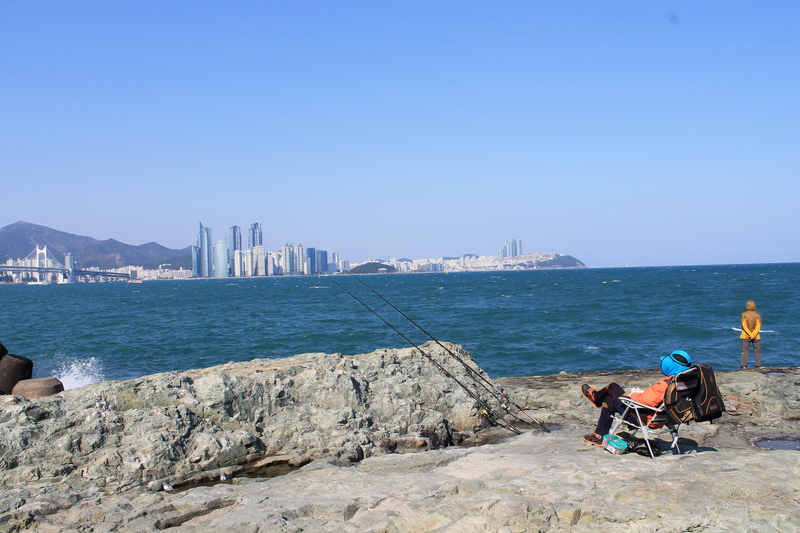 There were many people out on the rocks picnicking, fishing, or just relaxing. 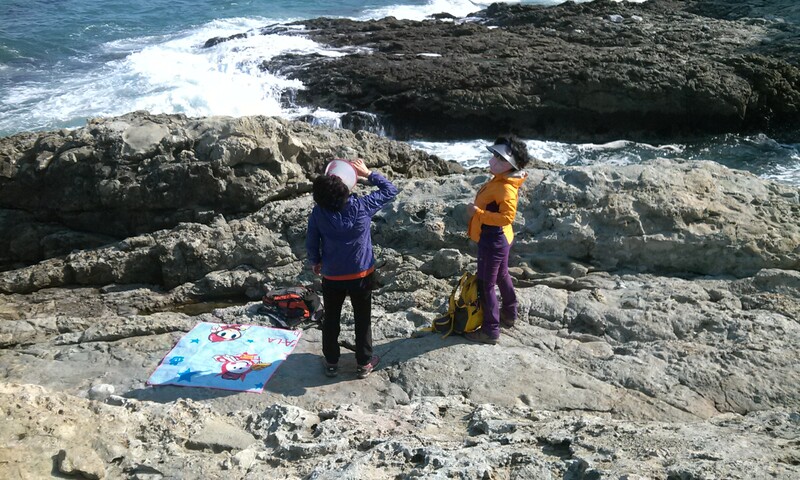 Quintessential Korean ajummas having a picnic on hard rocks while being covered head to toe lest the sun touch any speck of their skin. At one point we passed what looked like a bunker built into the cliff. 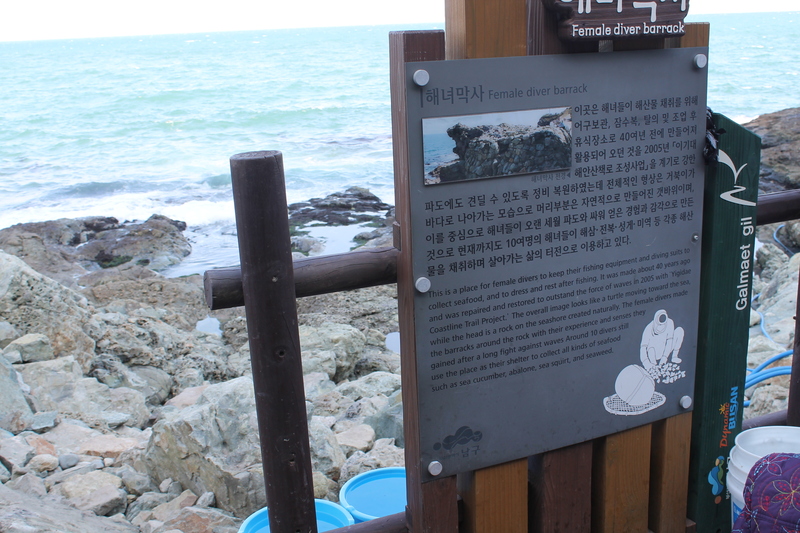 There was a sign explaining that these were barracks for the female divers who dove and collected sea creatures here. 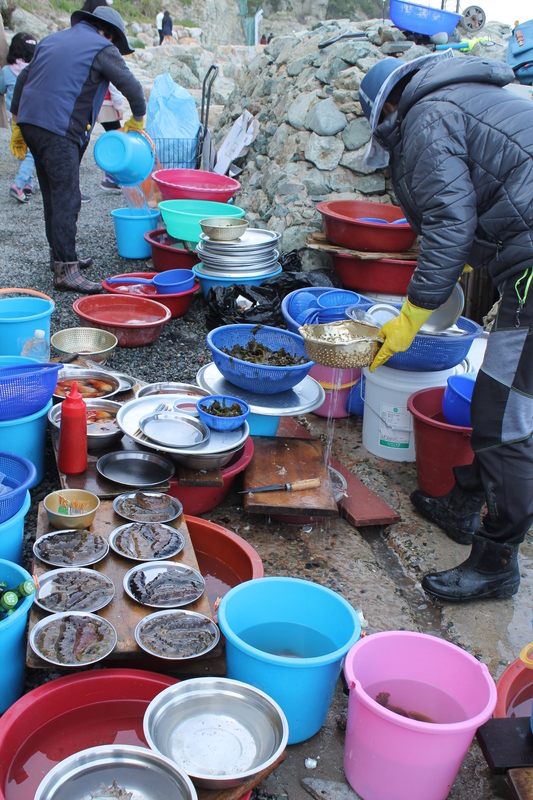 Then we saw these women selling said sea creatures for a fresh and tasty snack. I’m pretty sure most of these things were still alive. 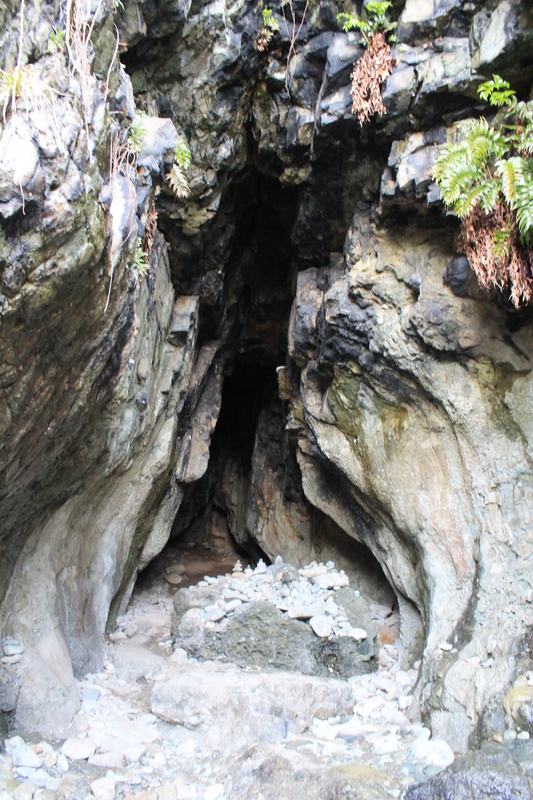 We discovered a cave along the way complete with the obligatory rock piles. 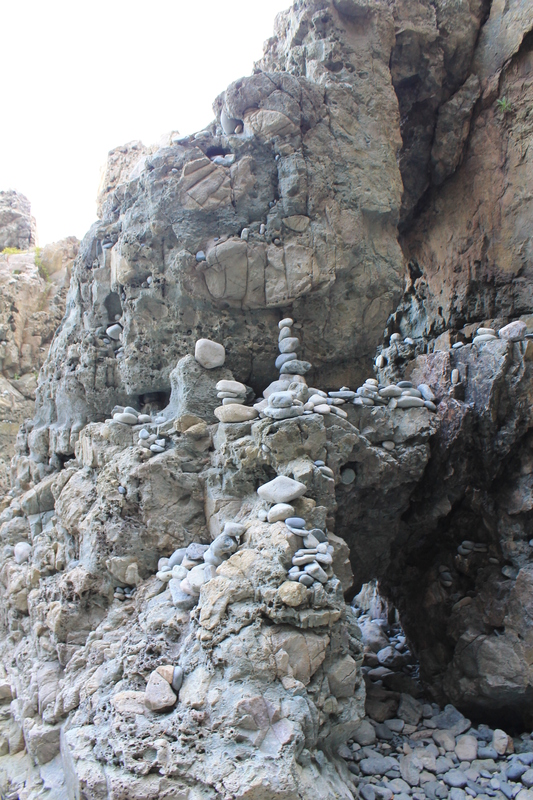 A naughty part of me always wants to knock those over. 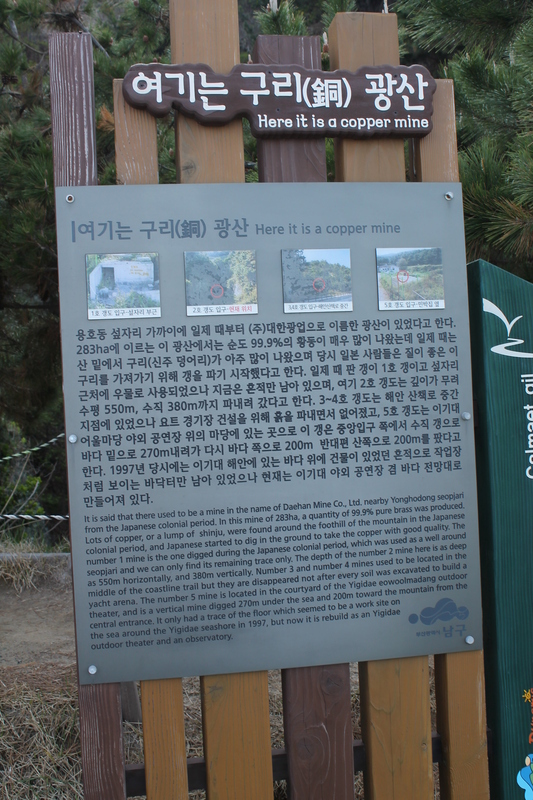 English translations: “Here it is a copper mine!” The moment you’ve all been waiting for has finally come! Two things about this – first, this man is just chilling doing standing pushups here on this railing. 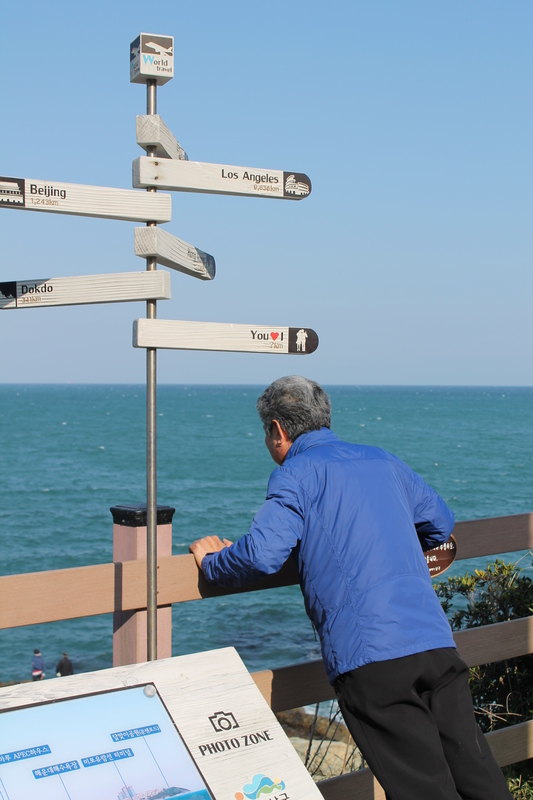 Second, this sign which has the distance to major international locations – Los Angeles, Beijing, etc. And then, also, Dokdo. Dokdo is a tiny island between Korea and Japan that both countries claim, but that Korea passionately insists belongs to them. “Dokdo is Korean Territory” is stamped on everything – random signs, notebooks from the stationary store, office supplies, Kleenex boxes, everywhere. I’ve heard there’s a channel that runs a continuous real-time feed of Dokdo. Dokdo is barely big enough to be called an island. It is literally two rocks in the middle of the sea. 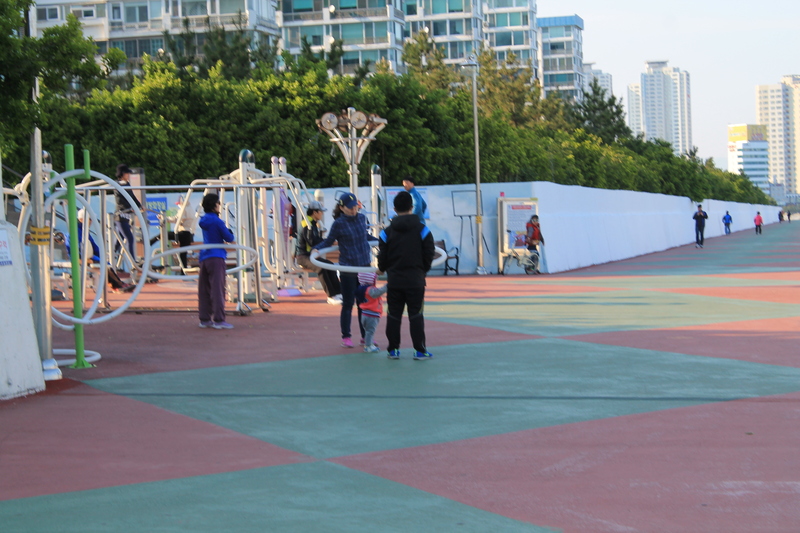 So, you know, right up there with Beijing and L.A.
On our way back for dinner we passed one of the outdoor gyms and I saw people using some of those giant hula hoops I’d seen on my hike last weekend. Blurry picture, but I was pretty excited. 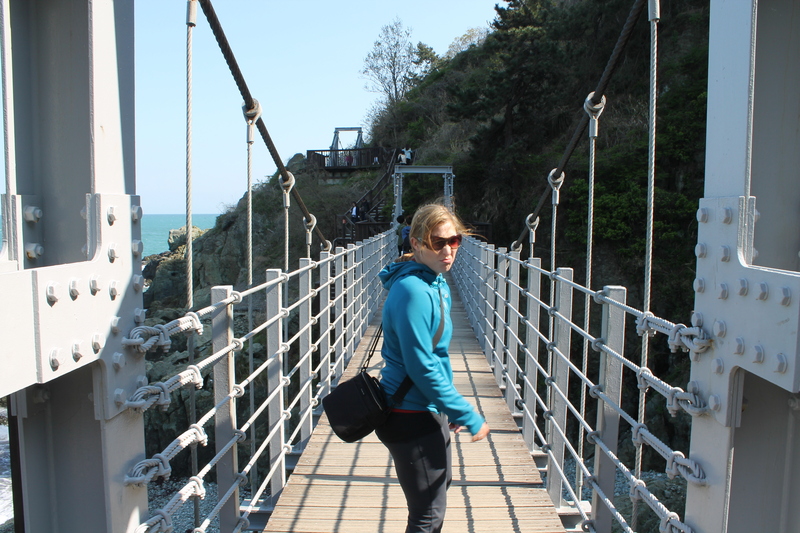 We always enjoy our trips to Busan and this one was no exception. 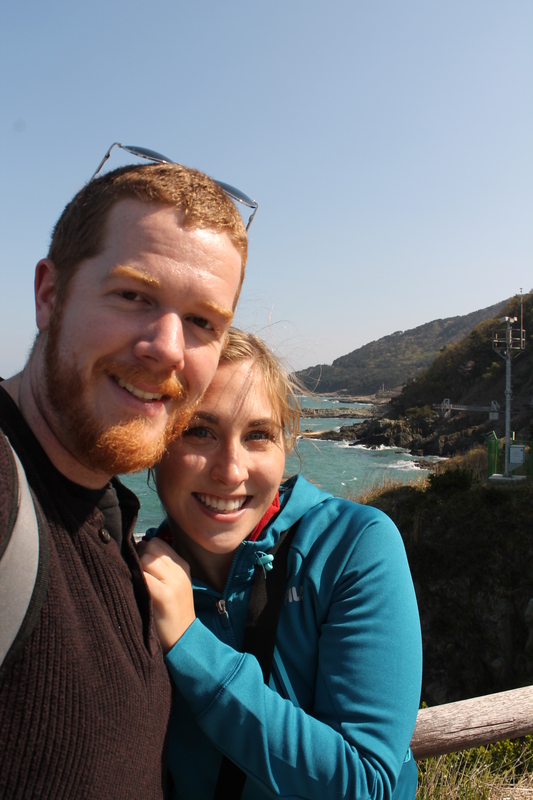 We hope to make it back a few more times before our Korean adventures are over. Igidae is beautiful! One of my favorite places there by far. Yes, it’s one of my favorites (now) as well. For a while I was absolutely addicted to South Korean soaps on Netflicks. They used the term ajumma all the time, but I never could suss out what it means. Mother? Auntie? Old Woman? This place looks absolutely beautiful. I’m glad you finally had a chance for another visit.